2017 is already looking to be one of Influential’s brightest years for new customer growth. Despite the persistent fears over Brexit, Influential have seen a surge in businesses looking for specialist Business Intelligence and Software Development services. 2017 promises to be an interesting year for our Business Intelligence teams. We are partners with the industry’s biggest, most established brands and are anticipating a bumper year of new software releases and tools. As a certified IBM Partner, we have worked with the ever improving Cognos range for over 10 years, from selling Cognos Licences to bespoke consultancy work. It is our depth of experience with Cognos and IBM that means we continue to win new clients. Our SAP teams are also looking forward to an exciting year. As a certified SAP Gold PCOE Partner, we are preparing to offer the very latest in SAP BI, SAP Cloud, SAP HANA and S/4HANA. In the meantime, our SAP Licence Sales, Consulting and Training teams have been attracting the attention of various high-profile businesses who appreciate Influential are cited as one of the leaders in the BI industry. The release of SharePoint 2016 saw a raft of improvements reinvigorate Microsoft’s popular application. Now perfectly integrated with the Microsoft Office suite, SharePoint offers a host of highly configurable applications for organisations such as a document management and storage system, even Intranets and Extranets. The Influential SharePoint team has years of experience, bringing in yet more expertise in 2016 to meet the increasing demand amongst our existing clients. 2017 has kept the team busy, with new clients and projects including content migration, consultancy services to improve performance and deliver best-practice solutions, as well as a surge in upgrades to SharePoint 2016. Influential have been in the Business Intelligence and Software Development business for over 20 years. We work hard to grow, retain and improve our internal teams, and we have a good eye for exactly the right talent we need. As a result, we developed an internal recruitment team to help find both emerging talent and seasoned experts. Watching our partners and clients searching hard for the right candidates, we realised we could better utilise our internal Recruitment Team’s skills and launched Influential People. The HM Treasury is the UK government’s economic and finance ministry. It maintains control over public spending, UK financial services and economic policy, strategic oversight of the UK tax system, the delivery of public infrastructure and works to achieve strong and sustainable economic growth. Its core objectives are to maintain sustainable public finances, increase employment and productivity, and ensure the economic and financial systems enable strong, sustainable and balanced growth on all levels. Lloyds Banking Group are a financial services group with millions of customers in the UK. They are a familiar presence on the high street and in nearly every community. Plus, with an impressive portfolio of brands, they work with more than 1 million businesses. Focused on retail and commercial financial services the company thrives based on how well we serve their customers and relationships within the communities they serve. The Insolvency Service is an executive UK Government agency, part of the Department for Business, Energy and Industrial Strategy. Their core function is to deliver economic confidence by supporting those in financial distress, maximising returns to creditors and tackling financial wrongdoing. The Insolvency Service has around 1,700 staff, operating from headquarters in London plus 22 locations across Great Britain. The agency has a range of responsibilities including the administration of bankruptcies and liquidations, act as a source of public information and investigating misconduct or criminal activity in UK businesses. Willmott Dixon are experts in construction, residential development and property support services. Their core aim is that everything they do is designed to be of long term value. Across the UK Willmott Dixon teams work closely with their partners and local people to deliver effective services and sustainable developments. With a £1bn turnover and 3,500 staff across the UK, the business has been growing since 1852 and retains a focus on the people: employees, those who they work for and the people in the communities in which they work. While a privately run company they proudly put shared value before share price. 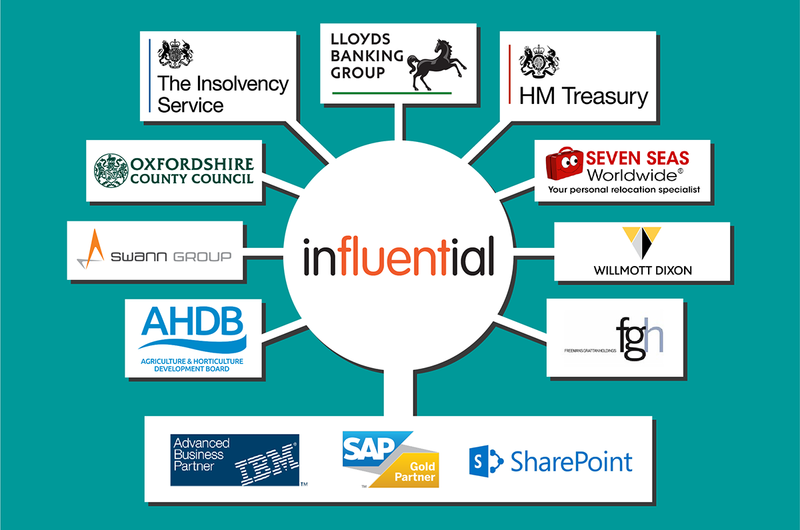 Influential are also proud to help deliver this value by employing their own specialist Business Intelligence Licences and tools. Freemans PLC (Freemans Grattan Holdings/FGH) are mail-order specialists. Founded in Bradford in 1905, they now have over 700 employees as the UK e-commerce wing of the Otto Group. Freemans PLC is home to a number of household retail and fashion names such as Freemans, Grattan, Kaleidoscope and much more. Selling across the globe, the business continues with its popular catalogue ranges but has diversified into global internet sales, reaching over 1 million customers each year. Freemans PLC continues to grow and diversify within such a large scale and widespread customer base. To do so, they are utilising specialist Business Intelligence and Analytics tools, which is where Influential Software step in. Seven Seas Worldwide (United Kingdom) are ‘Moving Specialists’. World leaders in both nationwide and global moves. Every year they help thousands of customers move or store their personal belongings, baggage and household items. In the global shipping business for over 20 years, they offer a vast array of shipping and storage solutions including MoveCube® mini-containers, StoreCube™ private storage, specialist student moving and excess baggage shipping services. Established in 1974, Swann Group Ltd offer bespoke engineering excellence, building a global reputation for the high-quality in-house product design, fabrication, installation and maintenance services by providing turnkey solutions for often-complex engineering problems. Swann Group operates across a range of high profile sectors which includes radar, iconic structures, rail, floodlighting, outdoor media and telecommunications. The Agriculture and Horticulture Development Board (AHDB) is an independent organisation, a statutory levy board funded by farmers, growers and others in the supply chain. Working independently of both Government and commercial industry the key purpose of AHDB is to inspire our farmers, growers and the industry to prosper in a fast-changing world. Tasked to equip the industry with best-practice and practical know-how needed, the goal is to improve decision making and boost performance across the sector. Oxfordshire County Council serves the most rural county in the South East. One-third of the 666,100 population live in towns or villages of less than 10,000 people. The county of Oxford is a popular visitor destination for its numerous market towns, rural beauty and the university city of Oxford itself, which has earned a global reputation for its academic and architectural splendour. Oxford is also a global centre of publishing, boasts high levels of employment and a highly-qualified workforce. This ensures the Council works with world-class business clusters including bioscience, advanced motorsport engineering, scientific research and cryogenics. Even with such rich talent on its doorstep, it’s not easy to find the right personnel. Influential People is Influential’s own specialist recruitment team. With years of experience in Business Intelligence and Software Development, Influential are able to deliver the right staff, with the right skillsets, to our highly demanding partners and clients.